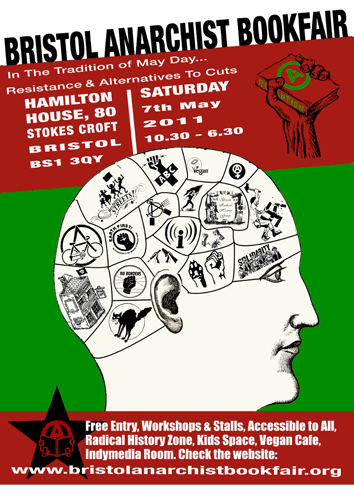 At this years Bristol Anarchist Bookfair BRHG will again be running the Radical History Zone. As well as a selection of book stalls from history groups and local publishers there we will also be hosting a series of talks (see below for details), poetry and a puppet show. There are also several events in the week running up to the bookfair including a BRHG talk by Gabriel Kuhn (see below). BRHG – History books including our own range of pamphlets. Just Seeds – Justseeds Artists’ Cooperative is a decentralized network of 26 artists committed to making print and design work that reflects a radical social, environmental, and political stance. Kate Sharpley – The Kate Sharpley Library exists to preserve and promote anarchist history. 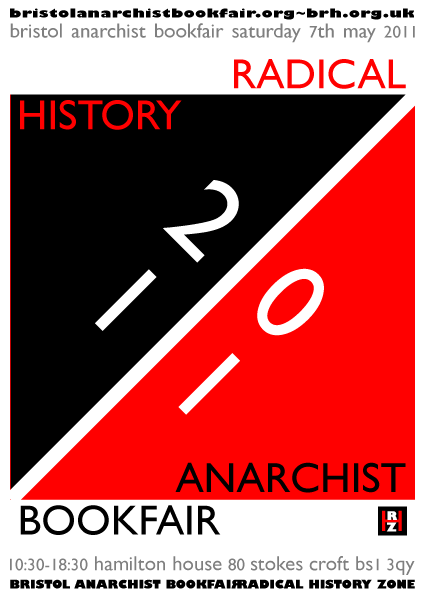 We preserve the output of the anarchist movement, mainly in the form of books, pamphlets, newspaper, leaflets and manuscripts but also badges, recordings, photographs etc. Richard Roberts – I am an amateur historian and wrote a translation of a work by Carlo Pisacane (La Rivoluzione). Pisacane was an early Italian anarchist, (precursor to Bakunin) and nationalist and ‘one of the most intelligent leaders of the Italian Risorgimento’ My translation also incorporates an introduction setting out biographical details of Pisacane and details of hos works and ideas in the context of the soxcial and political thoinking of the age. It is the first translation into English of his work and the first English work on him. PM Press – We seek to create radical and stimulating fiction and nonfiction books, pamphlets, t-shirts, visual and audio materials to entertain, educate, and inspire you. Bloom & Curl – Second hand bookshop and cultural space. Living Easton – Local history pamphlets from and about Easton. Northern Voices – Northern Voices is a roughly bi-annual regional journal, published by a Northern Anarchist Network affinity group, that aims at challenging the establishment in an interesting way that appeals to a popular local readership. Tangent – Bristol’s independent publisher that mixes anarchism, local guide books and humour.